JERUSALEM – The tomb of Jesus has been resurrected to its former glory. Gone is the unsightly iron cage built around the shrine by British authorities in 1947 to shore up the walls. Gone is the black soot on the shrine's stone façade from decades of pilgrims lighting candles. And gone are fears about the stability of the old shrine, which hadn't been restored in more than 200 years. "If this intervention hadn't happened now, there is a very great risk that there could have been a collapse," Bonnie Burnham of the World Monuments Fund said Monday. "This is a complete transformation of the monument." The fund provided an initial $1.4 million for the $4 million restoration, thanks to a donation by the widow of the founder of Atlantic Records. Jordan's King Abdullah II and Palestinian President Mahmoud Abbas also chipped in about 150,000 euros each, along with other private and church donations, Burnham said. The limestone and marble structure stands at the center of the Church of the Holy Sepulcher in Jerusalem, one of the world's oldest churches — a 12th-century building standing on 4th-century remains. The shrine needed urgent attention after years of exposure to environmental factors like water, humidity and candle smoke. Three main Christian denominations jealously guard separate sections of the church, but they put aside their longstanding religious rivalries to give their blessing for the restoration. In 2015, Israeli police briefly shut down the building after Israel's Antiquities Authority deemed it unsafe, and repairs began in June 2016. A restoration team from the National Technical University of Athens stripped the stone slabs from the shrine's façade and patched up the internal masonry of the shrine, injecting it with tubes of grout for reinforcement. Each stone slab was cleaned of candle soot and pigeon droppings, then put back in place. Titanium bolts were inserted into the structure for reinforcement, and frescos and the shrine's painted dome were given a face-lift. On Oct. 26, the team entered the inner sanctum of the shrine, the burial chamber of Jesus, and temporarily slid open an old marble layer covering the bedrock where Jesus' body is said to have been placed. The restorers have cut a small window from the shrine's marble walls for pilgrims to see — for the first time — the bare stone of the ancient burial cave. "It seems we are in front of levels of history that are validated," said Antonia Moropoulou, who supervised the renovation. The team is dismantling its worksite ahead of a ceremony Wednesday to mark the completion of the renovation, in the presence of two representatives of dueling Christian denominations — Ecumenical Patriarch Bartholomew I, who is the spiritual leader of the world's Orthodox Christians, and a representative of Pope Francis, the leader of the Catholic Church. Concern for the church's stability has brought Christian denominations together, and Moropoulou hopes it ushers in a "new era" of cooperation. She hopes the communities will make some changes in longstanding customs inside the church, like pilgrims smashing their lit candles onto the Edicule's stone wall, so the structure is not compromised. Now, money is being raised for another round of restorations — consolidating drainage and sewage pipes underground, around the tomb, to stabilize its foundations — so renovations won't be needed for years to come. "Here is a monument that has been worshipped through the centuries, and will be worshipped forever," said Moropoulou. A restoration team Monday announced the completion of a historic renovation of one of Christianity's holiest sites — the shrine that, according to tradition, houses the tomb of Jesus. The ornate shrine, called the Edicule, sits in the center of Jerusalem's Church of the Holy Sepulchre, one of the world's oldest churches, a 12th century building sitting on fourth century remains in Jerusalem's Old City. According to Roman Catholic and Orthodox Christian belief, the Edicule encases the ancient cave where Jesus' body was entombed and resurrected. The Edicule shrine is built around the original cave; visitors can kneel before a marble niche that covers what is believed to be the bench where Jesus' body was placed. The shrine, almost completely destroyed in an 1808 fire and restored in 1810, had not been maintained since, and its stone walls were buckling outward. Water, humidity and candle smoke all wore down the structure. "I would venture to say that if this intervention hadn't happened now, there was a very great risk that there could have been a collapse," said Bonnie Burnham of the World Monuments Fund, a nonprofit in New York that helped raise funds for the $4 million project. King Abdullah of Jordan and Palestinian President Mahmoud Abbas also donated about 150,000 euros each for the renovation efforts, she said. Starting last May, a Greek restoration team from Athens spent nearly a year removing parts of the Edicule shrine and putting them back together. Stone slabs were removed from the walls; decades of black candle soot and pigeon droppings were scrubbed off; and while the stone slabs of the facade were removed, titanium mesh and grout were inserted to strengthen the building's core. Most strikingly, the hulking and unsightly iron cage built around the shrine in 1947 to reinforce it, approximately 30 feet high, was removed. "This monument today is free. It is emancipated from the iron grids," said Antonia Moropolou, who supervised the renovations. The most dramatic moment of the restoration took place in late October, when Moropolou's team entered the inner sanctum of the Edicule — which is open to visitors — and slid back layer after marble layer covering the rock-hewn bench where believers say Jesus' body was placed after he died on the cross. There was a layer from the late-Crusader era of the 14th century, and an earlier layer from the fourth century, when the emperor Constantine built the original church. Underneath that was the exposed rock bench. "It was really important to see the bench, very flat and almost complete, from the right to the left, almost for the shape of one man [who] can stay on it," said Eugenio Alliata, an Italian archaeologist in Jerusalem who is a member of a Franciscan group that looks after Christian sites in the Holy Land. "This was really something very important. And it was the first time it has been documented as it is." The marble layers were put back in place, but one change was made in the shrine's inner sanctum: A small window was cut into one of the walls. Now, for the first time, visitors can get a glimpse of what's behind: the original rock wall of what tradition says is Jesus' tomb. Jerusalem (AFP) - A major restoration project at the shrine inside the Jerusalem church where Jesus is said to have been buried was completed Monday ahead of its inauguration, an AFP reporter said. 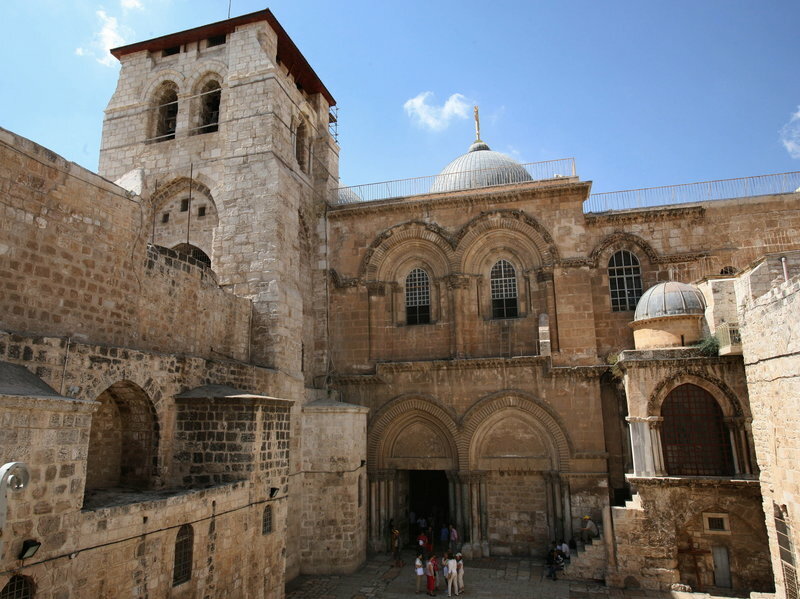 Work at the Church of the Holy Sepulchre in the Old City began at the end of last May. It was carried out by Greek specialists who reconstructed the Edicule, which for decades had been supported by metal beams following an early 20th century earthquake. The restoration and cleaning has uncovered the original details of the Edicule, the reporter said. The work also included opening what Christians believe to be Jesus's tomb for the first time since at least 1810, when the last restoration work took place after a fire, and possibly earlier. On Wednesday, the renovated site will be inaugurated in the presence of senior political and religious leaders from Greece, as well as Holy Land clergy. The work was funded by the three main Christian denominations that share the Holy Sepulchre -- Greek Orthodox, Franciscans and Armenians -- as well as from public and private contributions. The church also contains the area where Jesus is believed to have been crucified and his body anointed. 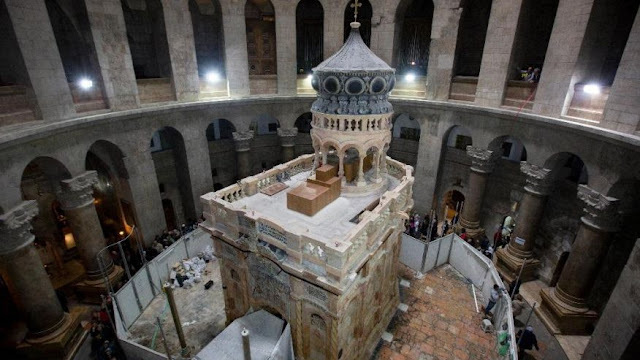 0 Response to "Historic restoration of Jesus' burial shrine completed"